Euro Truck Simulator 2 is brilliant. It’s all about driving trucks across Europe, delivering things like “long tubes” and meat, taking naps at service stations, going through toll booths, not crashing into cars and people, looking out of your window, turning on your wipers, staring at the road, sniffing the steering wheel. You know, important truck stuff. But far from being boring, Euro Truck Simulator 2 is somehow beautifully hypnotic. The rolling tarmac, the gentle splish-splosh of rain on your windscreen, the glow of the dashboard lights piercing the pitch blackness of a country road. There’s something god damned beautiful about this game and I recommend it without a shred of irony. 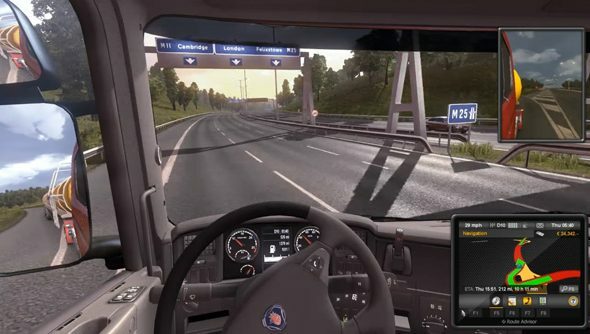 But if you’re at all hesitant to dive into the magical world of freight haulage, here’s twenty whole minutes of Euro Truck Simulator 2 gameplay in which I successfully deliver a tanker of acid to Rotterdam. Enjoy.